Metroidvania + Procedural generated levels sounds tough . Yet Discord Games has managed to make a masterpiece out of this two. 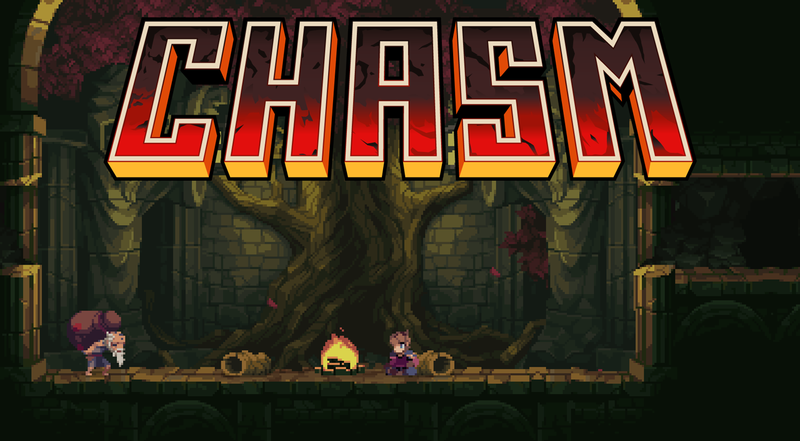 CHASM is a randomly generated metroidvania with strong roots on Castlevania: Symphony of the Night and in my opinion it could as well get to be the best game since SOM (Symphone of the Night) was released. I played the E3 2105 Demo like 15 times, which lasts around 12 minutes. I need more CHASM, and I need it now. Out of all the indie games I’m waiting or covering, CHASM is by far the one I’m expecting the most. First of all, who is Discord Games? Discord was founded by myself, James Petruzzi, and my partner Tim Dodd in 2011. We started making games in our spare time on the weekends and evenings about ten years ago, and things kind of grew from there. We released our debut title Take Arms in 2011, and started working on Chasm in 2012. We successfully Kickstarted Chasm in May 2013 and have been full-time on it since. What are the greatest source of inspiration for CHASM? By far Castlevania: Symphony of the Night is the biggest inspiration for the game. The whole concept came from playing that game and wondering how it would work if things were swapped around or changed each time you play. We’ve also added in a lot of influences from our favorite games growing up like The Legend of Zelda, Mega Man, Metroid, Batman, etc. Tell us about how is it to develop a procedural generated metroidvania? How do you make the experience feel fresh every time and how are rooms being generated? Figuring out how tie in procedural generation with a classic adventure has been by far the most difficult part of the project. We actually design all the rooms by hand, but when you start a new game our generator assembles them together into the areas based off rules we make. So, this way we can always have certain things in relative areas and encountered in sequence, while the overall content stays pretty high quality since we have a direct hand in it. Not knowing exactly what to expect around the next corner definitely goes a long way to making these kind of games much more replayable. Are there plans to add more content to CHASM once it’s release? We’re more believers in the old school methodology of delivering the full game on release. We don’t currently have any plans for extra content, but that’s not to say it won’t happen. We just want to make sure everything we think should be in the game is there when it launches, and if we think of cool things to add later perhaps we’ll do some updates. I read the game will be around 10 hours to finish. What can you tell us that will add to the replay value besides the random generation of the 6 areas every time you play? We’re not sure how long the full experience will be just yet, but we’re aiming to land somewhere in the 6-10 hour range. There will be tons of equipment and secrets find, different endings to aim for, as well as extra difficulties to really challenge yourself with. Can you tell us a bit about the skills Daltyn will posses? Daltyn finds ancient scrolls throughout the world that teach him new moves like Sliding, Ledge Grabbing, Wall Jumping, Flipping and more. Each one expands his moveset, and mastering it will be necessary for making your way through the world. Is there a main antagonist or anything you can share with us on the story? You play as Daltyn, a young soldier conscripted into the Guildean army and assigned to an outpost on the frontlines of a long running war. One day, the Commander of the outpost receives a letter from a nearby mining town explaining that an earthquake recently struck the town, and that the miners won’t go back to work after reported sightings of monsters in the mines. Daltyn is sent to investigate and put the miners at ease, but when he finally arrives in the town everyone has mysteriously disappeared. It’s now up to Daltyn to explore deep beneath the town and solve the mystery. Do you have a release window for CHASM on PC and PS4? We don’t have a release date just yet, but we’re hoping to get it out around the end of the year. Today Discord Games posted a new update on their kickstarter. Please check out the link for even more details and improvements to the game. As I said, this is really shaping to become a masterpiece.